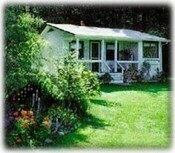 Primrose Path Cottage is an authentic Whidbey Island cottage. It was built in 1928 and offers true period charm of the 1920's and 30's. Nestled on a wooded acre, Primrose Path Cottage is a small, private cottage. This vacation rental has been viewed 7,996 times since 11/10/2006. Each property is independently owned and operated. All listing information has been furnished by the property owner/manager. Please read our disclaimer.